While examining the past will not allow us to exactly predict the future, we can identify patterns whose parts could prove useful in understanding contemporary affairs. By considering a key cause of World War I, the War of 1866/Austro-Prussian War, we may be able to see similar patterns in present events and forecast how they could shape the future. Here, Lieutenant Colonel Sean H. Kuester tells us about Germany and the War of 1866, and contrasts this with Russian actions over the last decade. 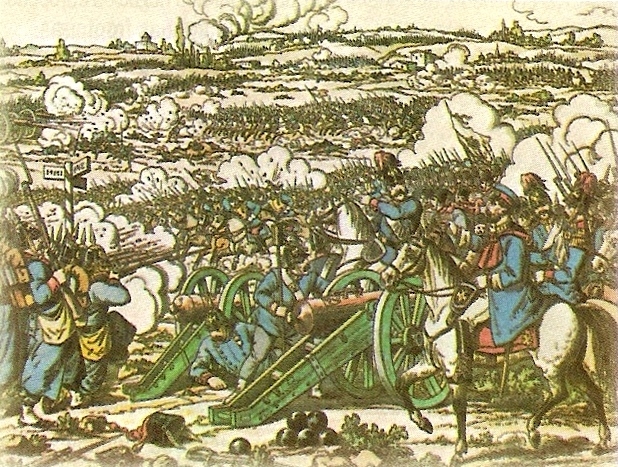 The Battle of Koniggratz in the War of 1866/Austro-Prussian War. "We spend a great deal of time studying history, which, let's face it, is mostly the history of stupidity." Stephen Hawking may be right. Nevertheless, in an effort to change the would be historical trajectory he describes, let’s take a stab at the past to craft a better future. For the next year, we will remain in the centennial window of World War I (WWI); one of the greatest man-made catastrophes in history. As such, it’s appropriate to refresh ourselves on how this momentous upheaval came to pass with a view toward understanding goings on in our own time. There is quite a bit more to WWI’s causes than the standard fare of rigid mobilization schedules and Archduke Ferdinand’s assassination. While these explanations capture immediate catalytic events, they neglect less visible yet more significant (in their predictive value) underlying causes. It is in these underlying causes where the true extrapolative lessons lie and where modern strategists may seek insights for contemporary happenings. One of the underlying causes occurred 71 years prior; the second war of German unification, also known as the War of 1866. This seven week clash was in its own time, and remains today, replete with both strategic and tactical portents. However, rather than being viewed as a singular incident it is better regarded as one of several successive gales in a gathering storm of national intent. This interconnectedness of events as indicators is a salient lesson. Given the conflict’s brevity and the fact that it occurred in the wake of the political upheavals of the 1848 European liberalist revolutions, most leaders failed to see the more profound implications of this war. As a result, one of the foundations for WWI was quietly laid. Waged between Prussia and Austria over the territory of Schleswig-Holstein, which Prussia and Austria won from Denmark in 1864, this short decisive war resulted in the Prussian state securing hegemony over the German speaking peoples of Europe. Perhaps more importantly, however, the struggle dampened liberalizing effects born out of the revolutions of 1848, namely broad popular support for more representative style governments. This dampening effect was combined with Prussian influence gained through battlefield preeminence and breathed fresh life into autocratic rule which would manifest itself ultimately in the visage of Germany’s powerful Kaiser. The temporal extension of this autocratic system allowed an inordinate amount of power to be placed in the hands of a very aggressive and ambitious few. While the Prussian victory in 1866 did not represent a tectonic shift in the continental balance of power it did indicate one of the first strategic tremors in the second half of the 19th century in Europe. Prussia would further unify the German peoples by defeating France in 1870-1871, placing itself at increased variance with the great European powers. Through degrees, which Europe saw but did not directly contest, Prussia consolidated the myriad German speaking states, subdued its weaker neighbors, appeased larger states and in time carved out an empire that challenged the continental order. Viewed in this light, the War of 1866 was the first major point of departure from German disunity to unity. Are we witnessing manifestations akin to the above scenario today? The case of a resurgent Russia is instructive. In 2008 Russia tested the world’s tolerance for her application of force to protect her so called privileged zone of influence when she invaded Georgia. The world complained, even elevating their outrage to “serious concern,” but did little else. Perhaps the world was not prepared to imagine that only 16 years after the collapse of the Soviet Union, Russia could pull this off. Western democracies bogged down in Afghanistan seemed disinclined to affix themselves to another conflict and confirmed their assumed passivity regarding a major force on force challenge on the continent; especially one so far East. Like the War of 1866, the Russian invasion of Georgia was a whirlwind, lasting only 5 days. Ending as quickly as it started allowed nations to surreptitiously go back to those affairs occupying them before. Russia had nimbly reasserted herself on Europe’s political stage. The aftermath is comparable to the relative calm that enfolded Europe after 1866. This calm in both cases was, of course, a phony edifice concealing loftier designs. Six years later Russia annexed Crimea and the world complained again. NATO complained loudly. However, three years on Russia still controls the Crimea and has flexed her might in the Middle East as well. She, like late 19th century Germany, seems single-minded in steadily gathering her strength to become a global force. Just as the War of 1866 was not the first nor last act of national intent to achieve Germanic unity, we must ask ourselves, where will Russia cast her gaze next? The West seems to remain fixated on the stalemate in the Ukraine and Crimea and equally as frustrated with Russia’s involvement in Syria. In spite of Russia’s clear successes in these areas will the west clumsily glower in those directions? With so much NATO effort on the Alliance’s eastern periphery, will Russia truly attempt to expand “Gray Zone” warfare into the Baltics or deeper into the Ukraine? Or, might Russia pursue something less obvious and less interesting for the West? Perhaps an attempt to consolidate her authority in Abkhazia and South Ossetia is the next increment of expansion; Putin commemorated the Russian-Georgia War by visiting Abkhazia this year. This is clear diplomatic signaling that this region is in Russia’s sphere of influence. Or perhaps Russia will attempt something still less predictable such as working to tilt Moldova in her direction. Moldova has parliamentary elections in 2018, and has been a traditional geopolitical halfway point between East and West. Or possibly Russia will be content expanding her influence east into the Central Asian Republics (CAR) where she can both grow her prestige, increase economic opportunity, and avoid substantial NATO interference while simultaneously frustrating NATO efforts in Afghanistan. The point is this: much like 19th century Germany, 21st century Russia possesses a long range national vision that certainly has stages and designs western strategists can discern. The Georgian War, the annexation of the Crimea, and Russia’s enthusiasm in Syria are not random acts of opportunity, just as the War of 1866 was not uncalculated opportunism. Russia’s next move will be no less premeditated. Inclining back to the War of 1866 with a view toward a phenomenon that resided below the strategic echelon, another observation may serve to reframe current events. One major feature of the War of 1866 was the growing ability to concentrate troops by rail to achieve mass at a point of one’s own choosing. In Arden Bucholz’s book, Moltke and the German Wars, 1864-1871, he concludes that rail usage was one component of a technological revolution in military affairs. What then is the significance of rail today? The key factor of rail in 1866 was that it provided a means to rapidly concentrate that era’s defeat mechanism (land power) where it needed to be before the adversary could counter it. The object for modern strategists, however, is to uncover the 21st century’s comparable means that can deliver this era’s defeat mechanism. One modern equivalent of this ability to concentrate a defeat mechanism may be found by splicing two rapidly evolving concepts: the swarm attack and cyber warfare. The potency of cyber warfare is self-evident and on the rise; its working definition is now generally well enough understood too. A useful initial definition of a swarm attack is provided by Sean J. A. Edwards in his 2004 RAND dissertation, “Swarming occurs when several units conduct a convergent attack on a target from multiple axes.” Swarm attacks are generally viewed as being physical attacks, but that interpretation is now incomplete, outmoded and likely on the cusp of shifting. The railway of the 21st century may be the internet with the coin of the realm being digitized information and operations (think banking data and air traffic control systems) and the ability to message or influence (think online news, social media and email servers). So how do swarm attack and cyber warfare conjoin together as a defeat mechanism? Imagine a scenario where distributed cyber operatives (hackers) use the internet to deliver malware. Envision further that instead of attacking one sector such as happened in 2015 against the Ukrainian power grid, cyber operatives simultaneously attack multiple sub-systems of a larger more complex system. What if operatives, for example, instantaneously targeted the health system, telecom industry, natural gas sector and electrical grid? In fact, such a scenario already played out – this year. The attack began in Europe and spread to over 100 countries. The motive in this ransomware attack appeared to be the accumulation of bitcoin. Imagine though, if the motive had been more sinister, with broader and a longer duration impact being the objective. Digitally delivered defeat mechanisms can be designed to achieve something akin to what the US Army’s Doctrine Reference Publication 3-0, Operations, calls disintegration which is “…to disrupt the enemy’s command and control system, degrading its ability to conduct operations while leading to a rapid collapse of the enemy’s capabilities or will to fight…specifically targeting…command structure and communications systems.” While it is difficult to imagine a state being “defeated” in the classical sense by a cyber-attack it is easy to conceive use of the internet “railway” to “collapse” a state or institutions’ critical capabilities or as part of a broader campaign or preliminary strike. “Whoever wishes to foresee the future must consult the past; for human events ever resemble those of preceding times. This arises from the fact that they are produced by men who ever have been, and ever shall be, animated by the same passions and thus they necessarily have the same results.” Machiavelli may have been no less jaded than Stephen Hawking regarding the record of mankind’s past. He did, however, see merit in studying the past. This work subscribes to Machiavelli’s outlook that clues to the future can indeed be found in the past if strategists ask the right questions and use their imagination. Historical patterns often repeat themselves. World War I was not the result of spontaneous combustion. The fuel for this fire was gathered and plainly stacked for all to see over the course of half a century. The War of 1866 was a primary underlying cause for WWI even though it occurred seven decades previous. While it did alter the strategic landscape in its overall result, as a single event it did not make WWI inevitable. Conversely, if viewed as one rung on a larger German ladder of national purpose and aligned with earlier and subsequent events, the case for a European showdown is strong. Embedded within the conflicts’ day to day operations innovations such as rail transport gave a marked advantage to the state visionary enough to exploit it. What did you think of this article? How are events of the last decade comparable to events before World War One? DISCLAIMER: The views expressed in this article are those of the author and do not reflect the official policy or position of the United States Army, Department of the Army, Department of Defense, or the U.S. Government.